On a board reading [qh][9h][8s], Dan Chalifour bets 500,000, Joseph Germain shoves all in, and Chalifour quickly calls. "I need a ten ball," Germain says, and without a blink, the [10h] comes on the turn, giving Germain the straight. Unfortunately for Chalifour, the [7s] river does not pair the board, and he is eliminated in 4th place. Chalifour had already locked up $22,737 and a $5,000 PPC Aruba package in a chop deal made when they were five-handed. Jason Wyllie shoves all in holding [jc][9c], and he's called by Joseph Germain holding [10h][9h]. The board runs out [2h][kd][ac][6s][5h], granting Wyllie a full double up. Carmelo Cambareri shoves all in and is called by Joseph Germain. The board runs out [qs][js][5h][2s][3s], eliminating Cambareri in 5th place. The remaining five players have come to a chop deal. They are playing it out for the second trip package and the trophy. Matthew Gambino shoves all in and is called by the chip leader, Dan Chalifour. Gambino turns over [kh][kd]. When Chalifour turns over [as][ah], Gambino says, "How do you pick up aces in this spot?" The board runs out [8c][7c][7h][10s][4d], eliminating Gambino in 6th place, paying $5,697. 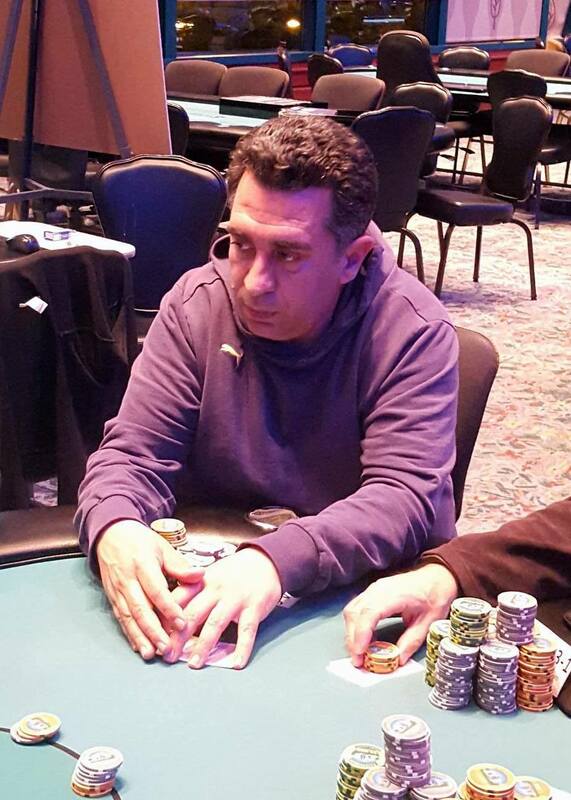 Dan Chalifour raises to 125,000 in the hijack, and Jeffrey Gellert shoves all in from the big blind. Chalifour calls. The flop comes [jd][7s][3s], leaving Gellert's nines in the lead. 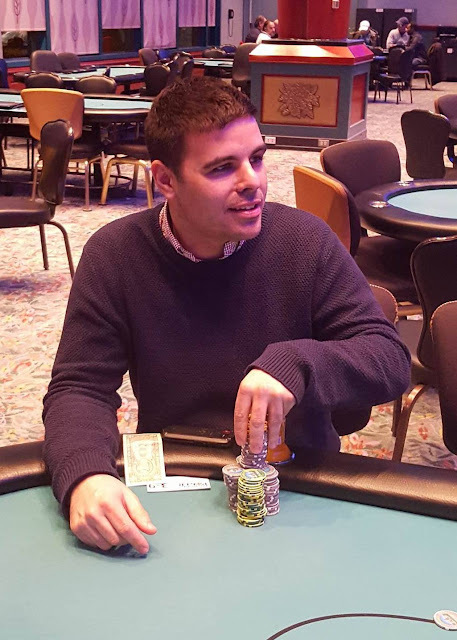 The [4c] comes on the turn, and Gellert maintains his lead, but the [10d] on the river gives Chalifour a higher pair and Gellert is eliminated in 8th place. Steven Brackesy shoves all in and is called by Dan Chalifour. The board runs out [jh][9h][4s][9c][ac]. Chalifour's king high is good, and Brackesy is eliminated in 9th place, paying $2,873. Jason Wyllie shoves all in from early position. 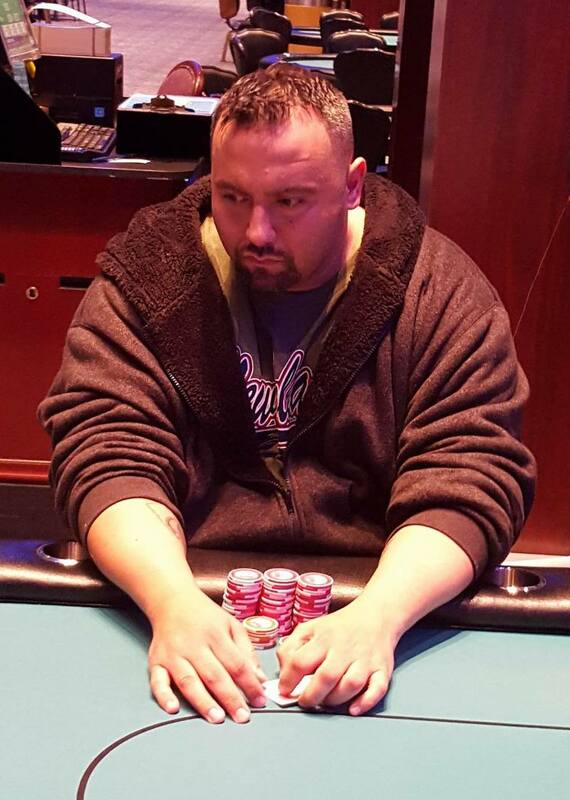 Action folds to Christopher Chan who shoves all in for less in the small blind. The flop comes [ks][kc][jc], giving Wyllie a full house. Unfortunately for Chan, the [7h] turn and [9c] river so not improve his hand, and he is eliminated in 10th place, paying $2,079. We are now down to the final ten players after Stephanie Tang got her kings cracked on table 2. The remaining ten players are now on break while we do an official chip count. Players will return to play the last 11 minutes and 17 seconds of Level 26 (15,000/30,000 blinds with a 5,000 ante). We will bring you a full chip count shortly. There were a total of 107 entries into today's $300 No Limit Hold Em Bounty Event. 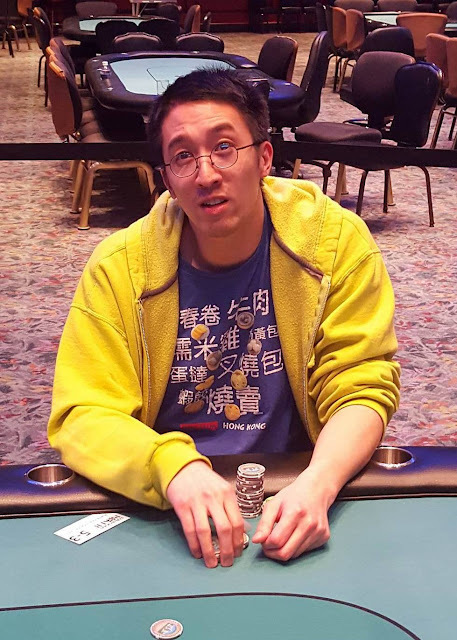 John Huynh shoves all in for 148,000 from early position. Another player in middle position raises to 300,000. 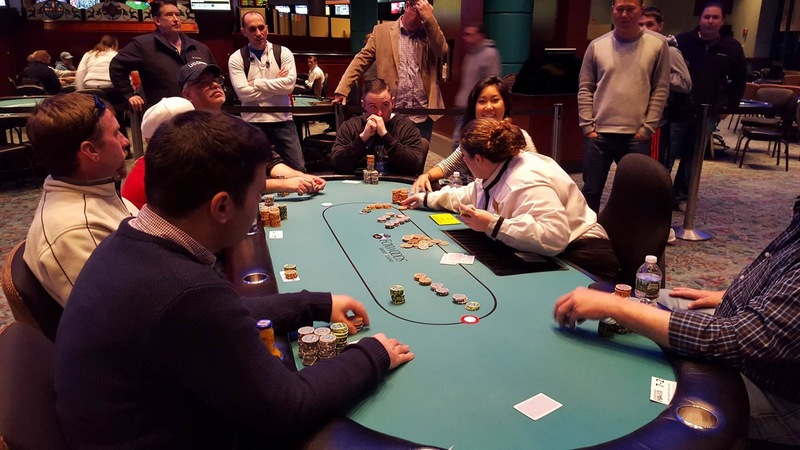 Action folds to Stephanie Tang in the big blind who shoves all in over the top of Huynh. The player in middle position stops to think for a moment before calling Tang's all in. The board runs out [qh][jh][3h][2c][7d]. Tang's nines hold up, and she is awarded nearly a triple up. There are 15 players remaining in Event #14, and they are now on a 60 minute dinner break. 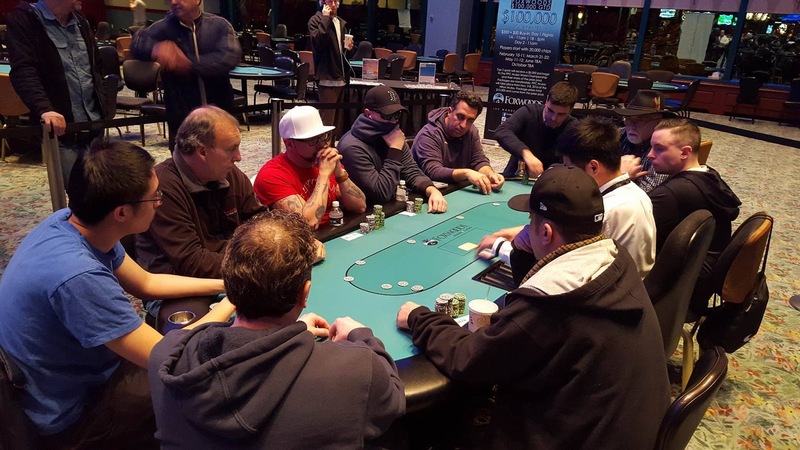 These 15 players will return to 10,000/20,000 blinds with a 3,000 ante. 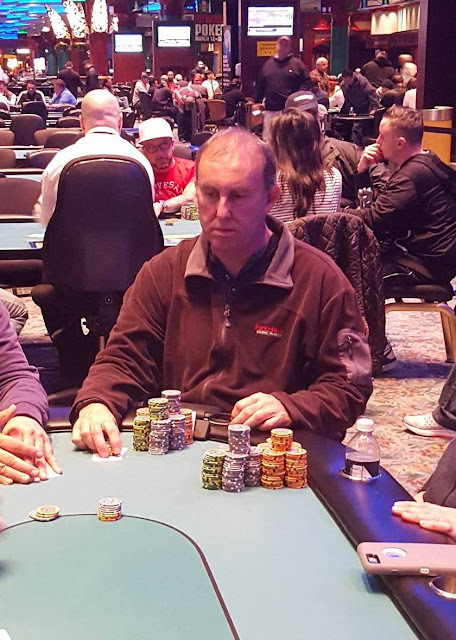 Facing an early position raise, Richard Jordan shoves all in for 43,000 and gets called. 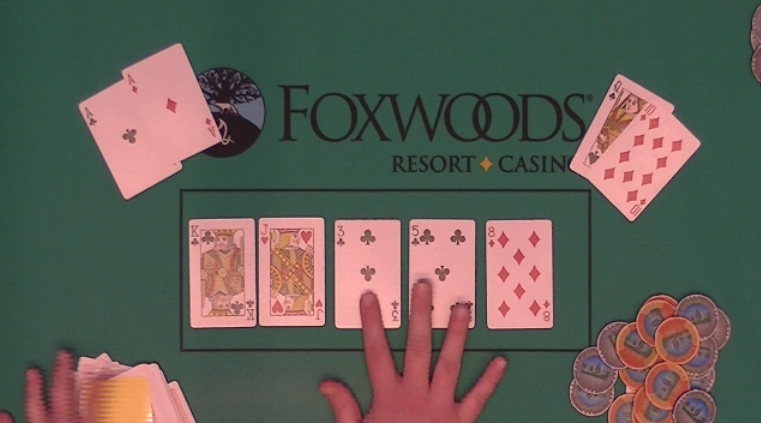 When the flop comes [10d][8d][2c], giving Jordan a set of eights, he says, "Yes!" The [7c] turn and [ks] river ensure Jordan a full double up. Action folds to Jordan who shoves all in holding [ac][kd]. He gets called by an opponent holding [7s][7d]. 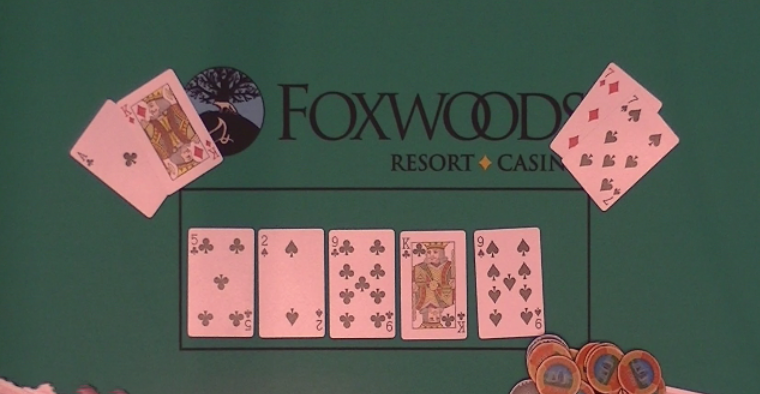 The flop comes [5c][2s][9c], and Jordan calls for a king or a club. He gets both when the [kc] comes on the turn. The [9s] falls on the river, and Jordan is awarded another double up. Wayne Kaufman is all in holding [ad][ks] against Carmelo Cambareri holding [10s][10c]. The flop comes [kd][qc][js]. When the [as] comes on the turn, Kaufman makes top two pair, but Cambarerir hits his Broadway straight. 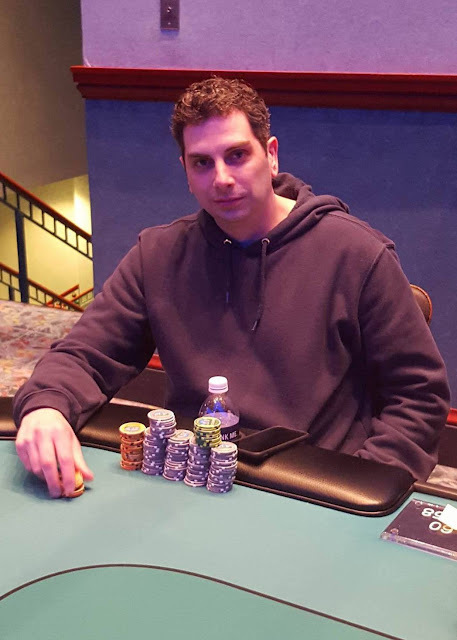 The [9h] on the river fails to pair the board, and Kaufman is eliminated in 26th place, paying $1,011. John Huynh raises to 51,000 in the hijack, and Dan Chalifour re-raises to 125,000 in the big blind. Huyhn goes into the tank for a solid three minutes. 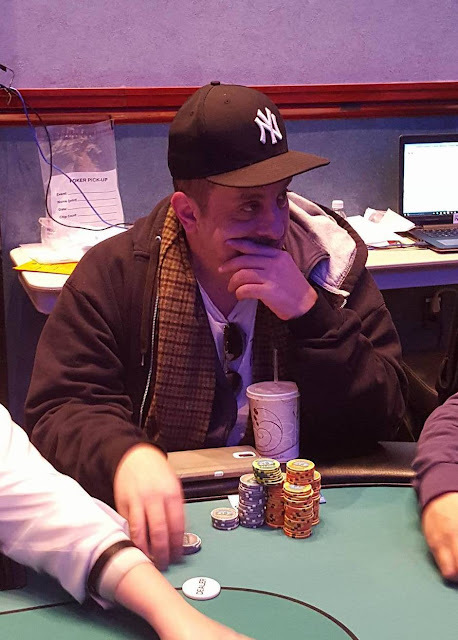 He counts out the chips to call, stands up and walks over to eye Chalifour's stack, and eventually sits back down in his seat. After another minute, Huynh folds [js][jd] face up. "Nice fold," Chalifour says. He slowly turns over [ad][ac] and says, "You owe me a show," To Huyhn. "Yes I do," Huyhn responds, "I just wanted to see a flop." Brendan Wiley shoves all in on a board reading [kc][jh][3c], and Joseph Graci quickly called. Unfortunately for Wiley, the [5c] turn and [8d] river did not bring him the straight outs he needed and he is eliminated in 37th place. After Wiley walks away from the table, a few players start discussing how Riley had huge hands in the beginning of the day, and got aces cracked at least once, if not twice. Charles Bunker shoves all in and is called by Stephanie Tang. The flop comes [7s][6s][3c], keeping Tang well in the lead. 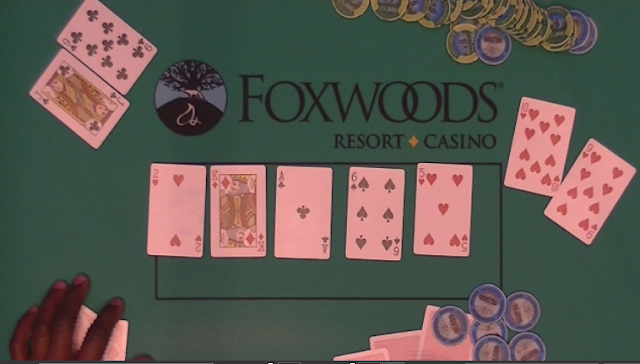 The [qs] turn gives Tang a set, but also gives Bunker the flush draw. When the [3s] comes on the river, Bunker makes his flush. A few players at the table ooo and ahh, but then another player points out that Tang has rivered a full house. "Oh, I didn't event see it," Tang says. "I just heard all of the ooo'ing and ahh'ing. That was emotional." Bunker is eliminated in 41st place, and Tang is now sitting with 260,000 in chips. 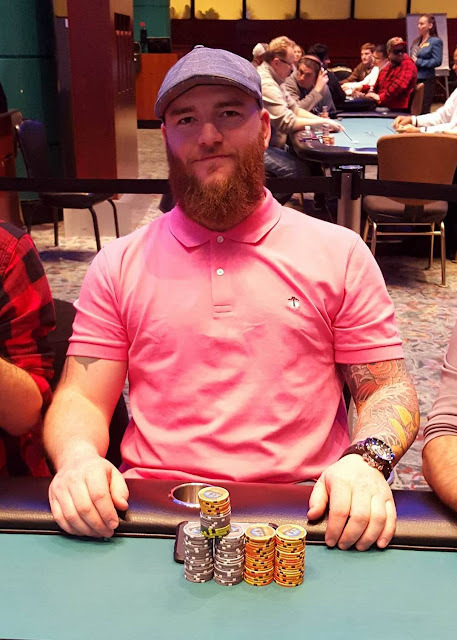 Mark Walsh took down the $400 six-max championship the other night. He then went on the make Day 2 of today's $400 NLH PPC Event, busting just short of the money. 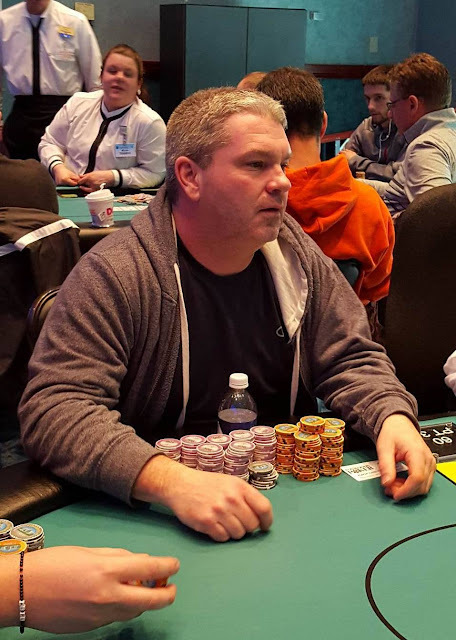 Walsh is now heading over to Event #15 ($400 NLH Bounty) in attempts to make another deep run, and ultimately take the trophy. Good luck to you Mark, and thanks for playing the Foxwoods Poker Classic Series! 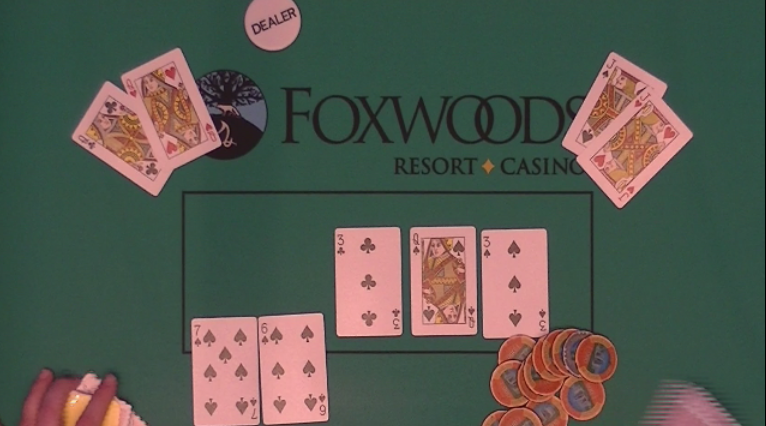 Paul Bradshaw shoved all in with pocket tens against The General's Ace-King. General hit a king on the river to eliminate Bradshaw in 45th place, paying $797. Facing a bet of 25,000, Matthew Sedgeman shoves all in from middle position for just under 100,000. Kevin Lynch tanks for nearly two minutes before calling the all in bet. Lynch is ahead holding [jd][js] against Sedgeman's two over cards, [ad][kd]. The flop comes [8h][3h][2c], leaving Sedgeman's jacks in the lead. He maintains that lead when the turn comes the [10c]. When the river finally falls the [5h], the dealer counts each player's stack and it's determined that Lynch is eliminated on the bubble, and all remaining players are now in the money. We are now down to 56 players, with 54 of them getting paid. We will soon go hand for hand until the money bubble bursts. Action folds to Eric Siegel in the hijack who shoves all in. It folds to Edwin Perez in the big blind who asks for a total. Upon hearing the 19,500 total, Perez calls. The board runs out [7h][5c][3h][ks][jh]. Perez will win the hand with his pair of kings, and Siegel is eliminated in 61st place, with 54 players making the money. According to Matthew Wantman, a hand ensued a few minutes ago that was very noteworthy. 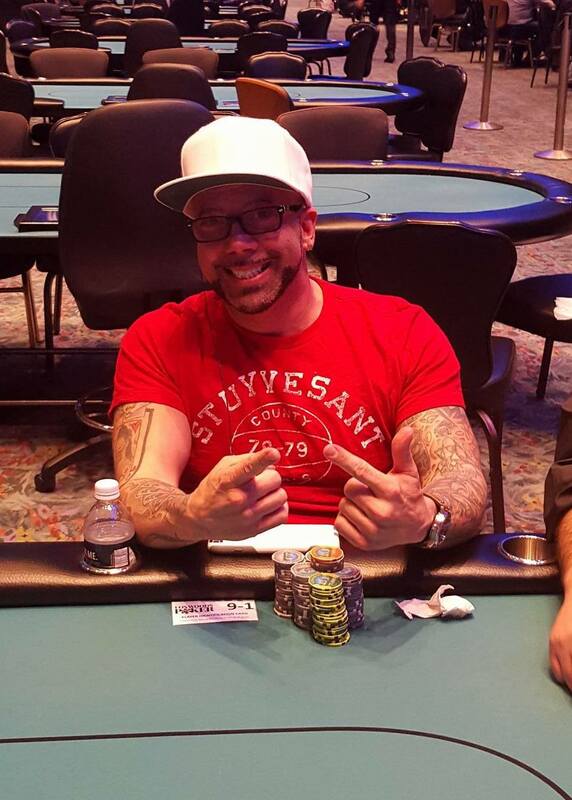 Jayme Parro shoved all in for 43,000 from under the gun. Action folded to Wantman in the big blind who called the all in, having Parro covered. Parro showed pocket tens, and Wantman showed pocket kings. The flop came A, 10, 2, giving Parro a set of tens to take the lead, but the KING on the turn gave Wantman the lead with his set of kings. It was the case 10 on the river that gave quads to Parro, and he is awarded a full double up. "Annndddd...we have 20,000," Wantman tells the blog staff. There are 79 returning players, 54 of which will make the money today, and are guaranteed at least a $697 payday. Players are now playing level 16 (1,500/3,000 blinds with a 500 ante). The average stack is 113,670. As a reminder, the top two spots will each get a $5,000 PPC Poker Tour package to the Championship event, November in Aruba.